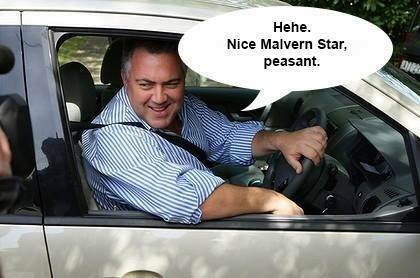 With news that Joe Hockey gets $270 per day in travel allowance without having to justify this expense and therefore paying off his mortgage with tax payer funds and also claiming $200 000 per annum to keep himself in transport and chauffeur driven cars, things are going from bad to worse for this dude and his party of corporate cronies. His apology also did not impress, the desperate rantings of someone who knows he is slipping down a cliff and taking the rest of his mates with him. Posted on August 17, 2014, in 1Uncategorized. Bookmark the permalink. Leave a comment.